We are back to share the second part of our Old Coast Oasis tour! Be sure to check out part one of the tour here. 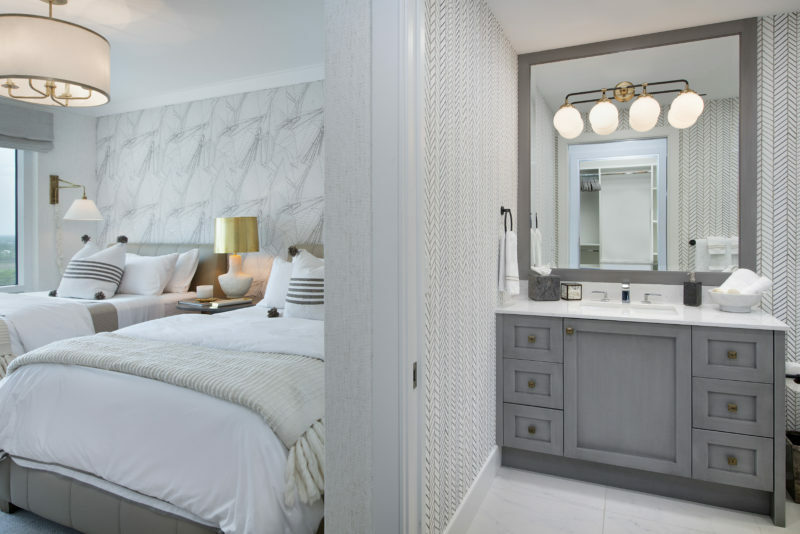 Today, we are going Behind the Design to explore the guest bedrooms, powder room, den and master suite. 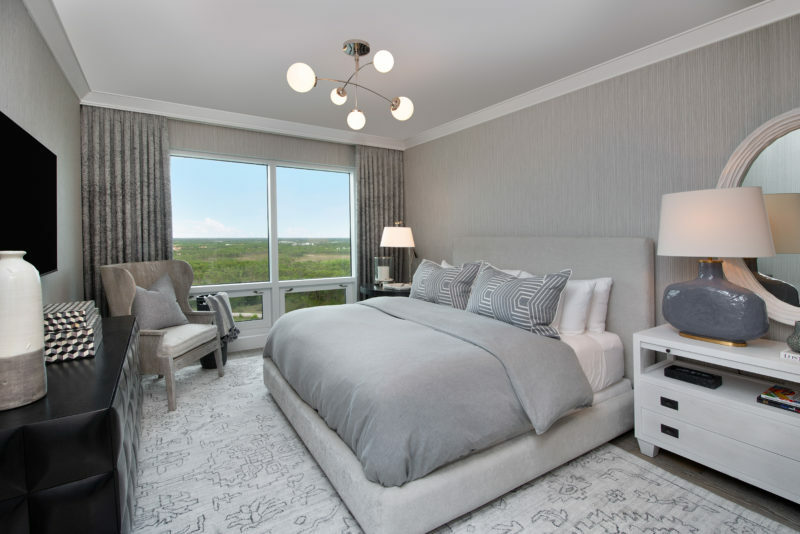 Wendy wanted to design a guest bedroom with a major WOW factor. Enter: the Hermes guest bedroom. What looks to be wallpaper is actually an upholstered wall adorned in Vent Portant fabric by Hermes. The fabric features sails and masts; the perfect nautical flair for this coastal home. 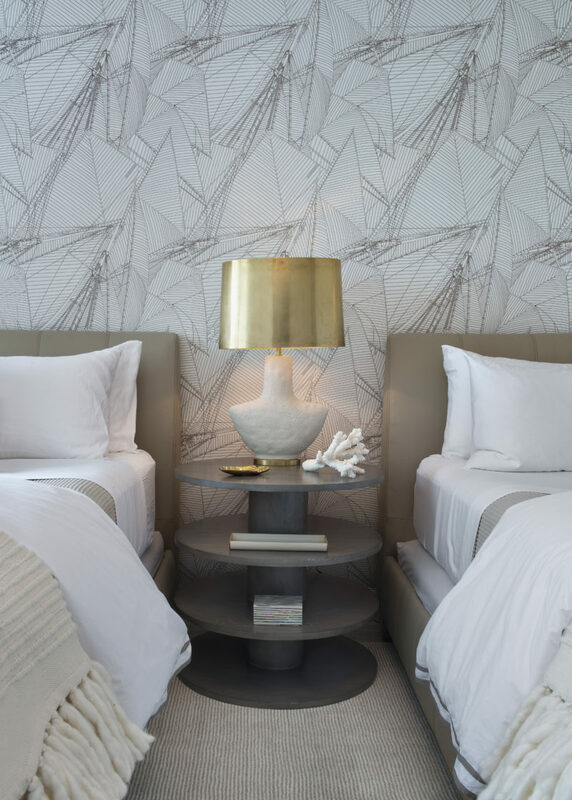 Brass fixtures create warmth against the crisp white bedding and camel colored leather beds. A fun and fresh Hermes wallcovering in a green-hued herringbone covers the guest bathroom walls. 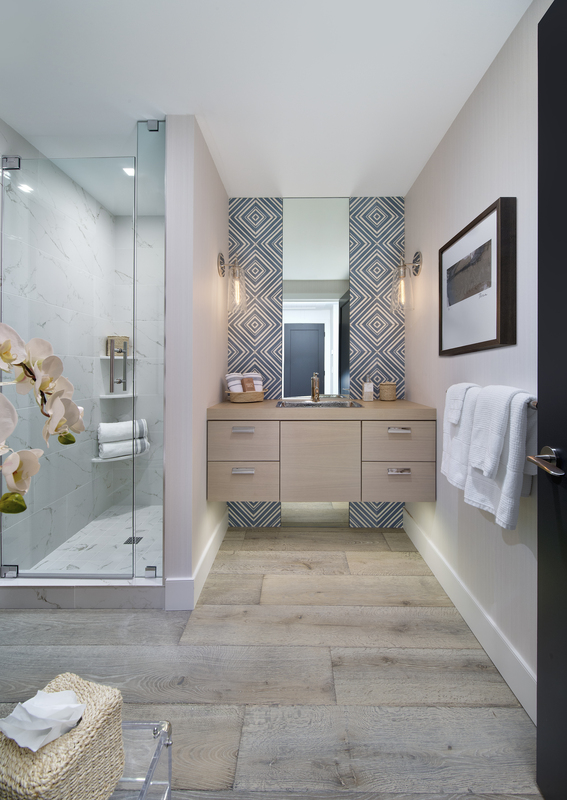 A wood frame was added to the bathroom mirror to match the lower cabinetry. The grey washed cabinets create the perfect contrast in this space. 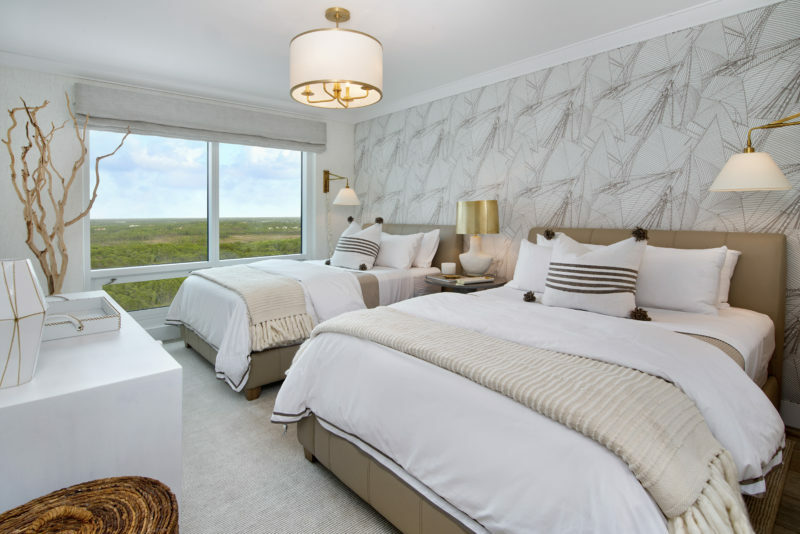 Moody with a masculine touch defines the second guest bedroom in Wendy’s gorgeous Florida home. A color palette of charcoal grey, ebony and white were introduced. 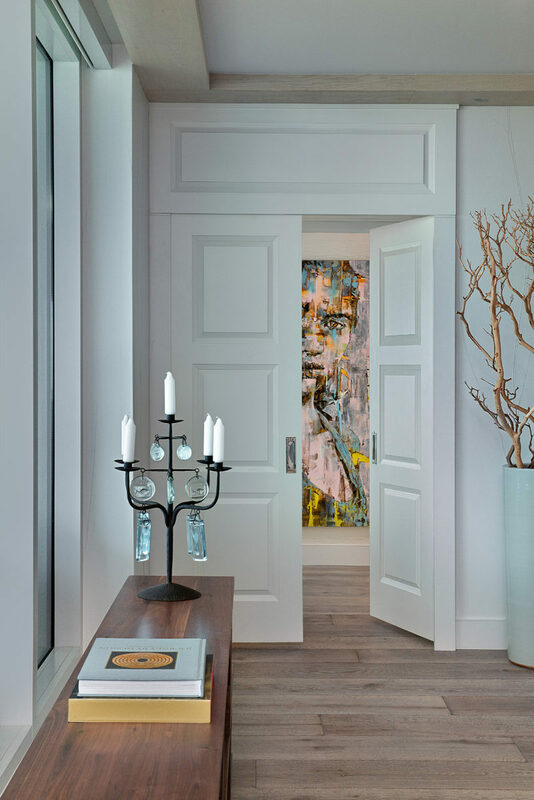 Clean lined furnishings, a mod ceiling fixture and rich textiles add dimension and interest to the space. Hello cement tile! This sleek design features a unique application of tile that runs seamlessly down each side of the vanity to the floor. A bleached wood cantilevered vanity adds to the coastal touch. 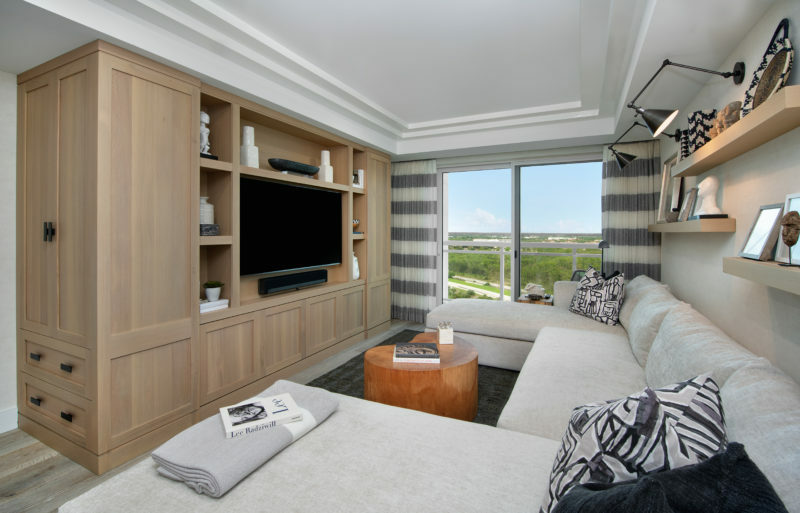 The fourth bedroom in this condo was converted into a den with a tribal influence. The custom built-in features full overlay stained rift white oak cabinetry. Concealed drawers and a cabinet provide excess storage space. Funky black and white throw pillows in a Robert Allen fabric make a statement on the custom double chaise sofa. Behind the sofa, a gallery wall of sort was created with floating shelves. African artifacts illuminated by black library lights line this cozy den. 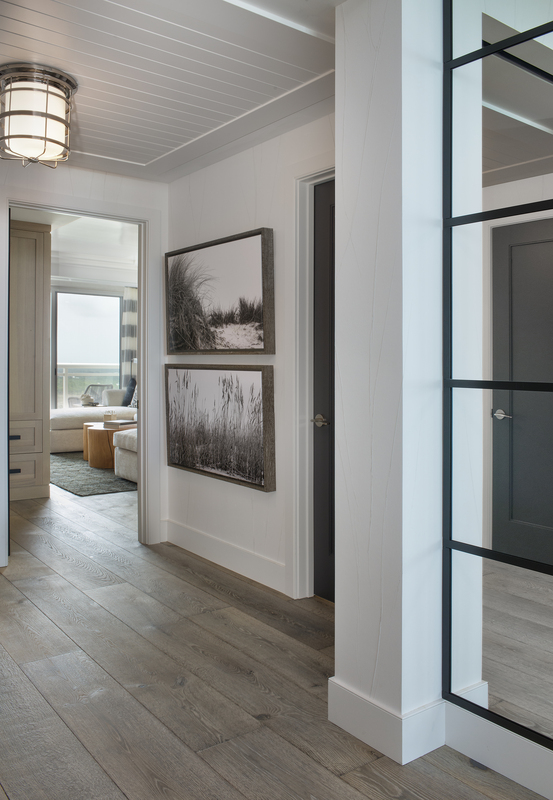 The entrance to the master suite features double doors with a custom shaker style detail. 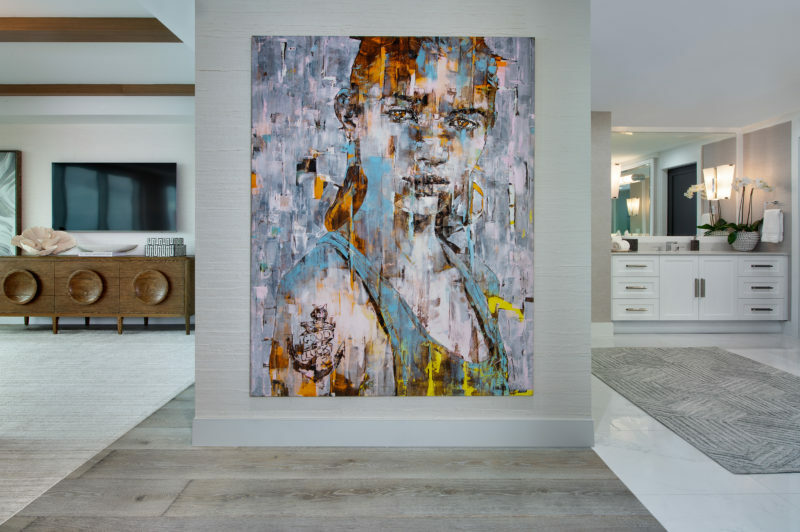 Doors open to a stunning Marco Grassi painting titled “Good Luck.” Wendy fell in love with this piece while exploring Capri, Italy. 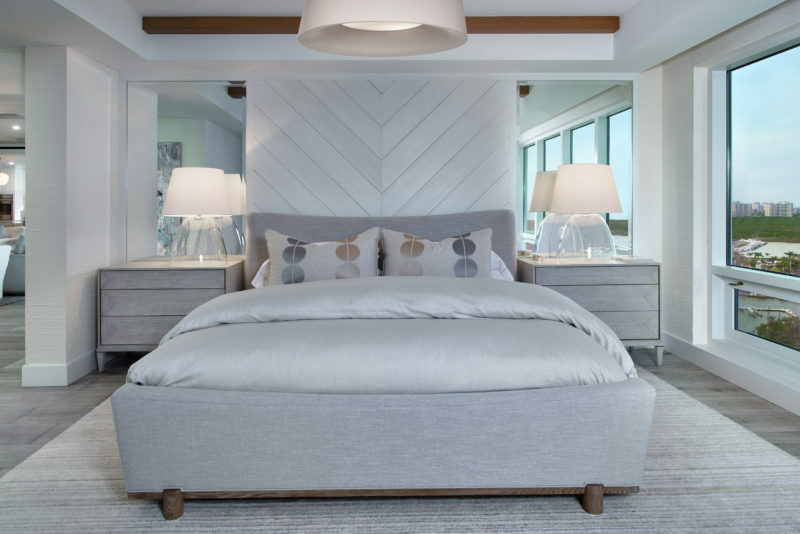 In the master bedroom, a chevron feature wall made of stained rift white oak wood frames the bed. Ceiling beams in a stained walnut adds depth to the tone on tone fabric scheme. 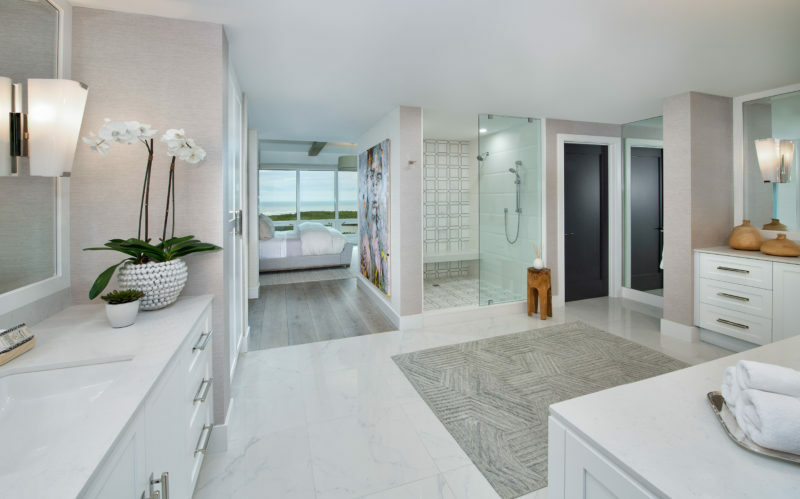 Moving through the master suite, the refreshing master bath feels crisp and clean. 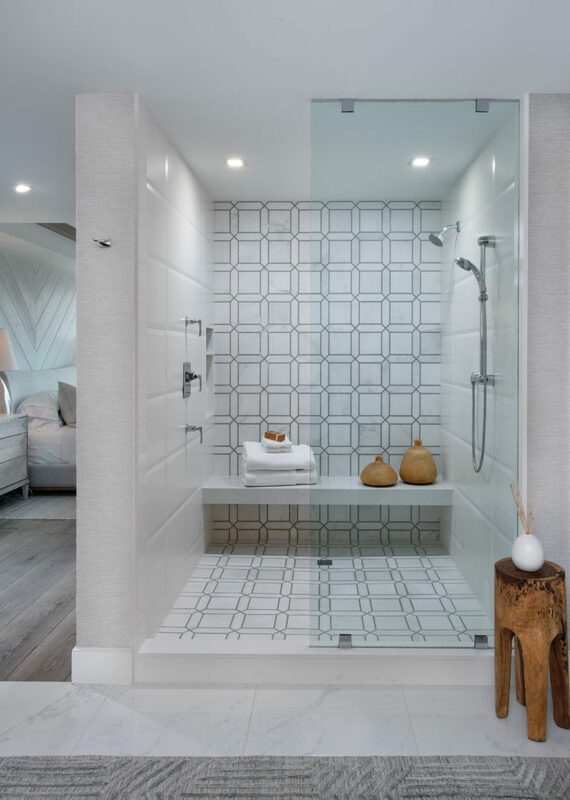 A gorgeous calacatta marble mosaic tile feature wall lines the shower wall.